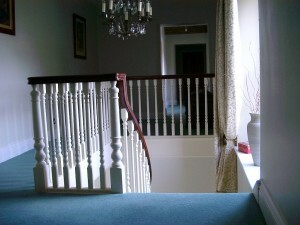 Burbeary Joinery is a family company with over 25 years experience in the business and manufacture purpose made joinery, specializing in staircase’s. We fully appreciate the deviations that sometimes happens on site and as such offer a flexible attitude towards ‘one-offs’. As corporate members of the ‘Guild of Master Craftsmen’ our emphasis has always been on quality, craftsmanship, reliability and flexibility and because of our long standing relationship with our suppliers, we can offer highly competitive prices too. With Burbeary’s you will be guaranteed a friendly service and our craftsmen will be on hand all through to help and advise on each aspect, transferring your ideas to plans and detailed design, whatever style you may require. We manufacture to current building regs. at all times and offer a full design service. A feature staircase, as you can appreciate, is an important feature of any house and can have a great impact on your home in terms of ambiance and value. We specialize in designing and building staircases and have, over the years, gained an enviable reputation for our work within the building industry. Please feel free to talk to us at any time, we are here to assist you with any detail however small. As a member of the forest stewardship council (FSC) we are committed as a company to purchasing timber from committed sources around the world which are monitored to keep there forests sustainable! Sign up to our monthly news feed and receive all the latest news and access to our special offers.